MREAC has been involved in Striped bass (Morone saxatilis) stock and habitat assessment and management work on the Miramichi River. 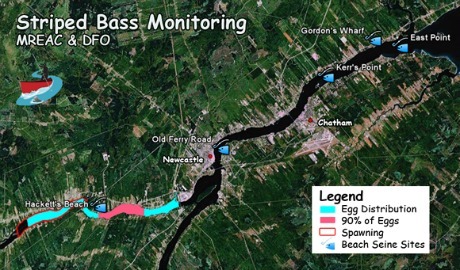 Support for protecting, monitoring and advancing the Striped bass management is particularly important as a limited stretch of the Northwest Miramichi River is critical spawning grounds for this fish species. 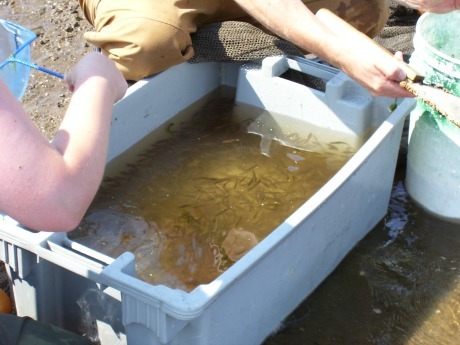 MREAC partners with DFO along with other community based groups (including the Southern Gulf of St. Lawrence Coalition on Sustainability) to determine the migration rates of juvenile Striped bass out of the Miramichi. The status of the Gulf of St. Lawrence Striped bass population on the COSEWIC list is "threatened" and under SARA the status is pending "public consultation". The Striped bass stock was extirpated from the St. Lawrence River around the mid sixties, leaving the Miramichi River to be the only known spawning habitat for this species in the Gulf of St. Lawrence. During the summer months (June-August) from 2005-2009, MREAC staff with DFO support conducted beach seines at five sites weekly in order to determine the status of the Young-of-the-Year (YOY) Striped bass stock. Fish are collected, counted and returned back into the river. Water quality data and general observations are also collected. This data is compiled and shared with DFO's biologist Mr. Scott Douglas. In recent years, the Miramichi has provided juvenile bass to re-introduce this fish to the St. Lawrence River. In order to help with protection efforts of Striped bass, MREAC is working with DFO and AAROM to promote awareness about the threat of this species. As of 2004, Striped bass of the Southern Gulf of St. Lawrence population is labeled by COSEWIC as “threatened”. This means fishing of this species by ANY manner is prohibited. The Miramichi River is critical habitat for the survival of this species as it is the only known spawning area for this population in the Gulf of St. Lawrence. Protection of their spawning area from human disturbance and pollution is important, and efforts are increasing as research unveils more information about Striped bass and their annual migrations. Promoting the awareness of the prohibition on recreational fishing of Striped bass helps in the recovery of the spawning population of this fish species. Please help us in our efforts and protect this fish!